Entering the world of blogging and technology has been a whole new world for me. I have slowly been taking baby steps in learning things I never even knew the meaning of; or need for. I have been wanting to learn how to make my own printables to share with you and I am proud to announce that I have finally figured out how to do so! I am super excited and I hope you will be too!! To celebrate this huge step for this little baby blogger ;) I am giving this free printable to all my subscribers! If you are not a subscriber you can ---->ENTER HERE and get all my posts sent straight to your email! I love putting up scripture around my home to remind of God's truths throughout the day. This print is obviously the theme and heart behind this blog. 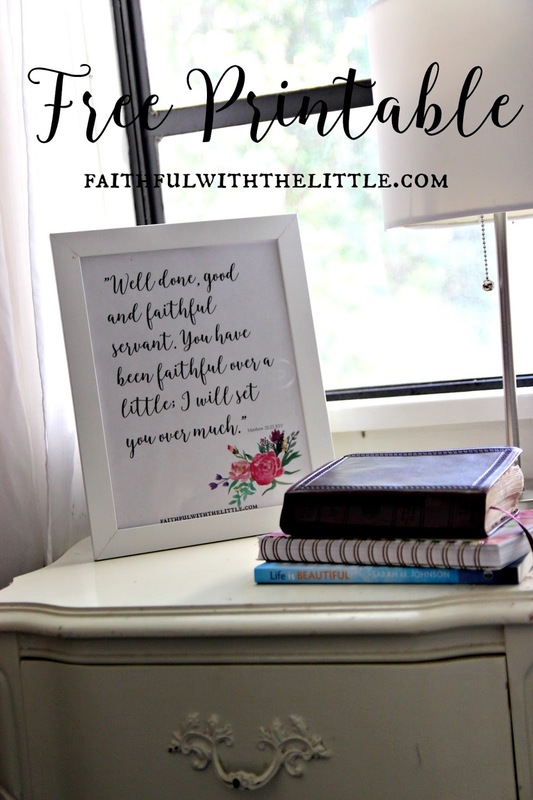 It's the verse that inspired me to start this blog and I pray it inspires you also, as you seek to remain faithful with all God has given you! 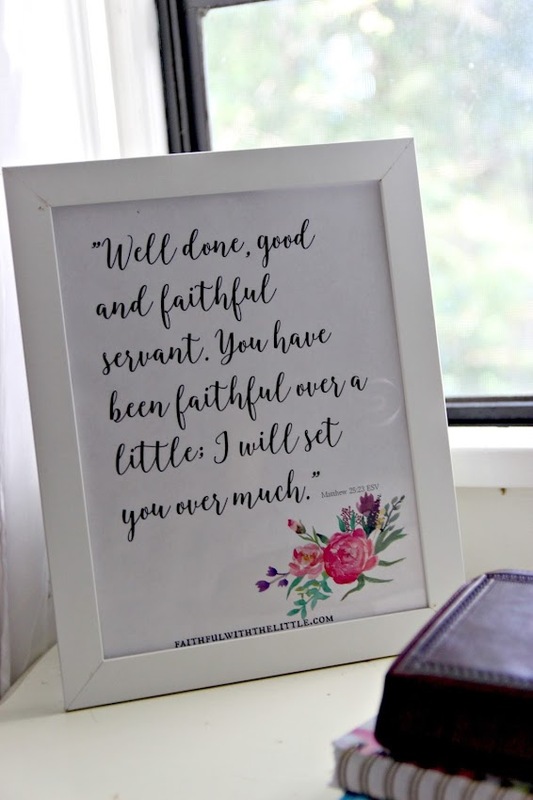 Do you like putting scripture around your house also? Adorable Rebekah! I love this print. It is so cute. Thanks! So am I! ;) I'm so glad! What a wonderful verse to make your first printable !!!!! And it is cute. Thanks for sharing. So beautiful! I love having scripture in my home as well- so encouraging to see it as I go about my day. Thank you for sharing this with us! Thank you so much Jes!! What a beautiful printable. Such inspiring words. Hope your new journey to blogging is going well. There's a lot of things to learn, but the people you meet are worth all the hard work. Thanks so much for joining us this week on #SHINEbloghop and for sharing this post with us! Thanks Maria! You are so right! I have really loved getting to know so many amazing bloggers and glean from all their knowledge and insight! Thanks for hosting! I love the colors in these flowers - so much prettier than the handwritten index cards I usually just stick up somewhere with verses on them! Thanks for joining us at Friday Frivolity and I hope to see you there again this week! 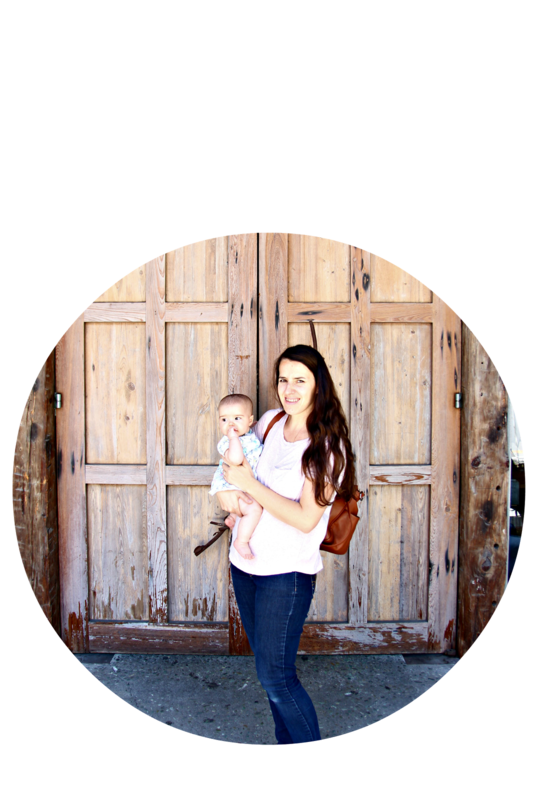 Lovely printable, thank you for sharing! :) Pinning it!